Alex Wong/Getty ImagesWhite House Chief of Staff John Kelly in the East Room of the White House, July 31, 2017 in Washington, D.C.
White House chief of staff John Kelly reportedly grabbed Corey Lewandowski, Donald Trump’s former campaign manager, by the collar and pushed him against the wall during an argument in February. Lewandowski reportedly did not physically respond to the incident. The Secret Service was called, and the two men calmed down. White House chief of staff John Kelly reportedly grabbed Corey Lewandowski, Donald Trump’s former campaign manager, by the collar and pushed him against the wall outside the Oval Office during an argument in February, according to a New York Times report published Monday. The altercation began after Trump met with Kelly and Lewandowski, people briefed on the incident said to The Times. Kelly reportedly complained that Lewandowski had profited from Trump through his contract with a Trump-supporting political action committee. Kelly also highlighted some of Lewandowski’s public remarks against him, which concerned his response to a scandal involving Trump’s former staff secretary, Rob Porter. The former staffer was accused of emotionally and physically abusing his ex-wives. Kelly and other White House officials at the time gave contradicting accounts about how they dealt with the allegations. Trump reportedly had to take a phone call and Lewandowski and Kelly continued their heated conversation in the hallway. Kelly then called someone to see Lewandowski out of the building, which fuelled the argument, according to The Times. After Lewandowski raised his voice, Kelly grabbed him by the collar and pushed him against the wall. Lewandowski did not respond to the escalation, several people familiar with the incident told The Times. Secret Service agents responded to the disturbance, the newspaper said, but Kelly and Lewandowski decided to let it go. 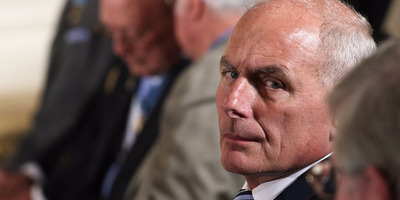 Kelly, the former four-star Marine Corps general hired to establish order in the White House, has had numerous confrontations with other senior White House officials during his tenure. He is believed to have quarreled with first daughter Ivanka Trump and senior adviser Jared Kushner over their nearly unfettered access to the president. Despite the president’s repeated denials, numerous reports suggest Trump’s relationship with Kelly to be irreparably damaged. Trump has reportedly mused about firing Kelly, and at the same time, Kelly is also believed to have threatened to quit his post. The alleged incident marks another dramatic episode in the Trump administration. Current and former officials have described the White House as one filled with infighting and backstabbing, according to several published tell-alls and memoirs from people who have since left the White House. Lewandowski, who left the Trump campaign in the middle of the heated 2016 US presidential election, remains a staunch loyalist and continues to defend Trump.